p.(excerpt) This article explain how to setup a JEE Project on your application server using Eclipse WTP. Prerequisites: install Eclipse WTP, and setup an application server to run JEE project on appropriate target runtime. In workspace create New > EJB Project; give it a simple name “HelloEJB”, check Target runtime is set to your application server, and click on Finish. 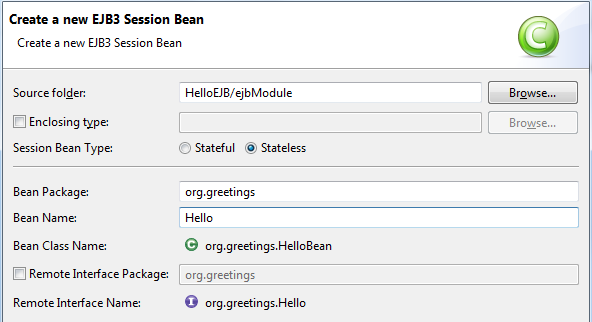 In the project create New > EJB 3 Session Bean; define the package org.greetings, give it the name Hello, and clicK on Finish. In the HelloBean write the implementation. Now, in the workspace create a New > Dynamic Web Project; simply call it Hello and click on Finish. Inside the Hello project create a New > Servlet; set org.greetings as package name and HelloServlet as class name, then click Next. In the second page give it a short name hello (note that the mapping is automatically changed in /hello) then click Next. In the last page deselect the doPost method, so we will have only the doGet, then click Finish. I need for my presentation logic the reference to the Bean that contain the business logic, os i add a compile-time reference to my EJB project. from Hello project > properties > Java Build Path select the Properties tab; click Add, add a reference to HelloEJB then click Ok and close. Now I can open the hello servlet; insert a reference to local business interface of the bean; and, by using the @EJB annotation, I inject the HelloBean into the hello variable. Then I can implement the doGet method in which i retrieve the name parameter from httpRequest, and I can pass it to the HelloBean, and, agian, i pass the result as response of the Hello servlet.